Kananaskis Country is a park system situated to the west of Calgary, Alberta, Canada in the foothills and front ranges of the Canadian Rockies. Kananaskis Country can be accessed by three highways that run into or through the area: Highway 40, a 66 km (41 mi) segment of the Bighorn Highway and also known as Kananaskis Trail; Highway 66, a 28 km (17 mi) highway originating near Bragg Creek known as Elbow Falls Trail; and Highway 68, a 42 km (26 mi) gravel highway originating from the Trans-Canada Highway (Highway 1) known as Sibbald Creek Trail. An ecological and environmental research station of the University of Calgary is located nearby, at Barrier Lake. A "Tim Horton Children's Foundation" summer camp is also located in the area. Easter Seals Camp Horizon is also located within Kananaskis along Highway 66. The area is named for the Kananaskis River, which was named by John Palliser in 1858 after a Cree acquaintance. 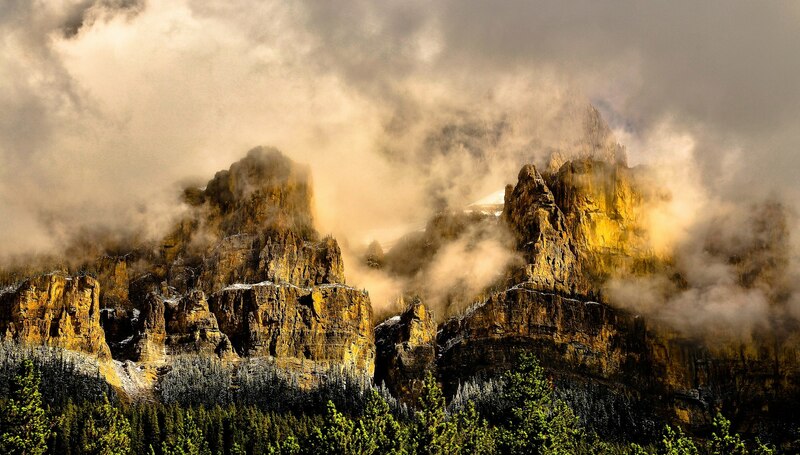 Castle Mountain is a mountain located within Banff National Park in the Canadian Rockies, approximately half-way between Banff and Lake Louise. 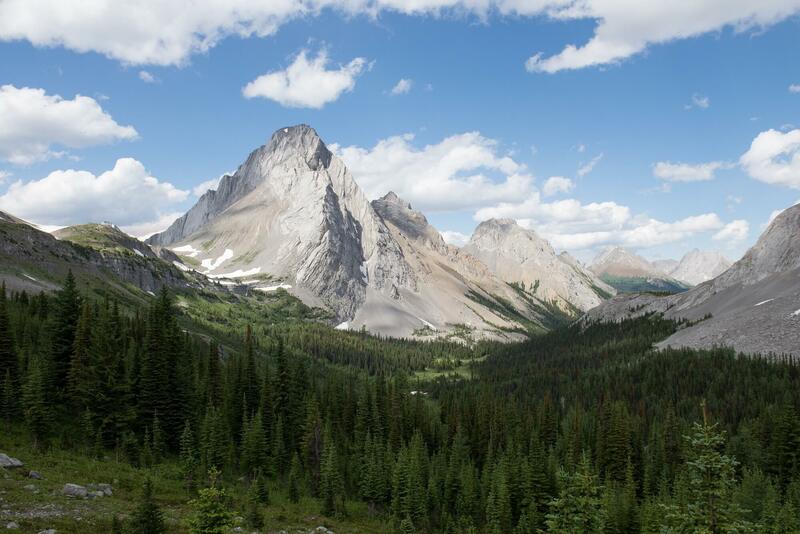 It is the easternmost mountain of the Main Ranges in the Bow Valley and sits astride the Castle Mountain Fault which has thrust older sedimentary and metamorphic rocks forming the upper part of the mountain over the younger rocks forming its base. The mountain's castellated, or castle-like, appearance is a result of erosive processes acting at different rates on the peak's alternating layers of softer shale and harder limestone, dolomite and quartzite. The mountain was named in 1858 by James Hector for its castle-like appearance. From 1946 to 1979 it was known as Mount Eisenhower in honour of the World War II general Dwight D. Eisenhower. Public pressure caused its original name to be restored, but a pinnacle on the southeastern side of the mountain was named Eisenhower Tower. Located nearby are the remains of Silver City, a 19th-century mining settlement, and the Castle Mountain Internment Camp in which persons deemed enemy aliens and suspected enemy sympathizers were confined during World War I. While looking nearly impenetrable from the Trans-Canada Highway, the peak can be ascended from the backside on the northeastern slopes. The trail to Rockbound Lake leads hikers around the eastern side. 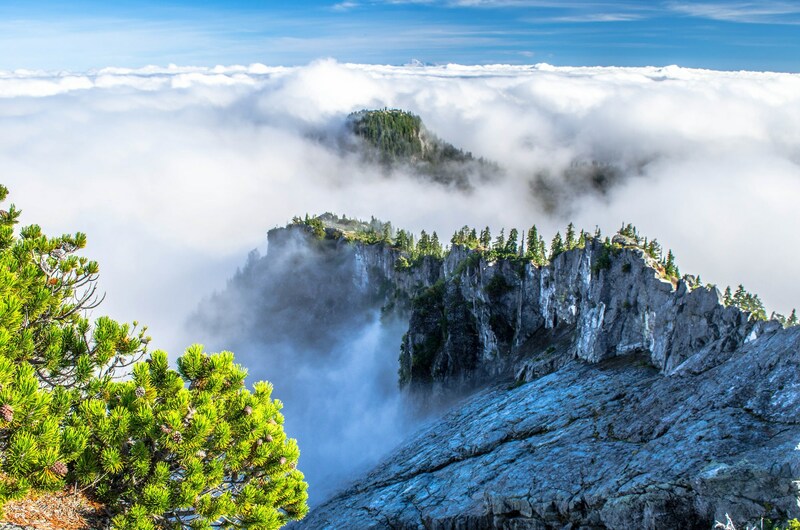 The massif contains several high points including Helena Ridge (2,862 m (9,390 ft)), Stuart Knob (2,850 m (9,350 ft)) and Television Peak (2,970 m (9,744 ft)), the latter being named for the TV repeater located on top. Technicians use a helicopter rather than hiking the long ascent to the top. The Gaspésie (official name), or Gaspé Peninsula, the Gaspé or Gaspesia, is a peninsula along the south shore of the Saint Lawrence River to the east of the Matapédia Valley in Quebec, Canada, that extends into the Gulf of Saint Lawrence. It is separated from New Brunswick on its southern side by the Baie des Chaleurs (Chaleur Bay) and the Restigouche River. The origin of the name "Gaspé" comes from the Mi'kmaq word gespe'g, meaning "end", referring to the end of the land. A Basque linguist has instead suggested "Gaspé" comes from a mutation of the Basque word "geizpe", meaning "shelter", however this view is disputed. The Gaspé Peninsula is slightly larger than Belgium, at 31,075 square kilometres (11,998 sq mi). The population is 140,599 as of the 2011 census. Lake Louise, named Lake of the Little Fishes by the Stoney Nakota First Nations people, is a glacial lake within Banff National Park in Alberta, Canada. It is located 5 km (3.1 mi) west of the Hamlet of Lake Louise and the Trans-Canada Highway (Highway 1). Lake Louise is named after the Princess Louise Caroline Alberta (1848–1939), the fourth daughter of Queen Victoria and the wife of the Marquess of Lorne, who was the Governor General of Canada from 1878 to 1883. The emerald colour of the water comes from rock flour carried into the lake by melt-water from the glaciers that overlook the lake. The lake has a surface of 0.8 km2 (0.31 sq mi) and is drained through the 3 km long Louise Creek into the Bow River. Lake Superior (French: Lac Supérieur; Ojibwe: ᑭᑦᒉᐁ-ᑲᒣᐁ, Gitchi-Gami) is the largest of the Great Lakes of North America. The lake is shared by the Canadian province of Ontario to the north, the U.S. state of Minnesota to the west, and Wisconsin and the Upper Peninsula of Michigan to the south. It is generally considered the largest freshwater lake in the world by surface area. 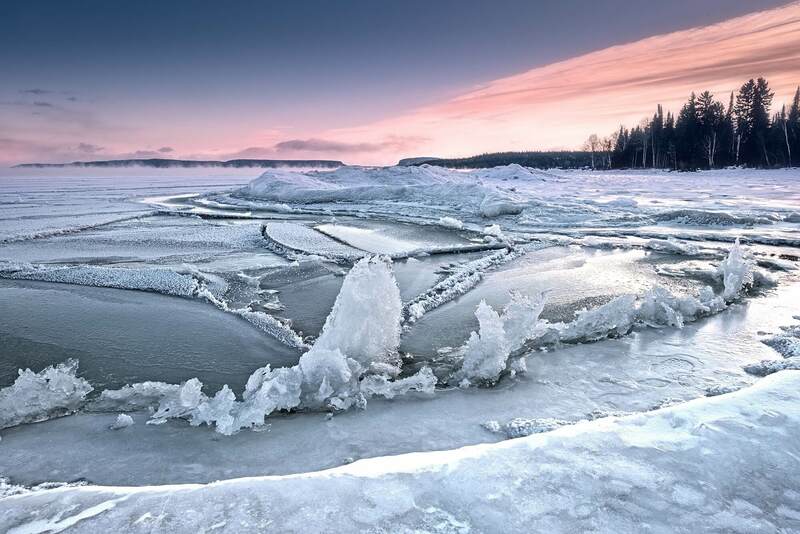 It is the world's third-largest freshwater lake by volume and the largest by volume in North America. 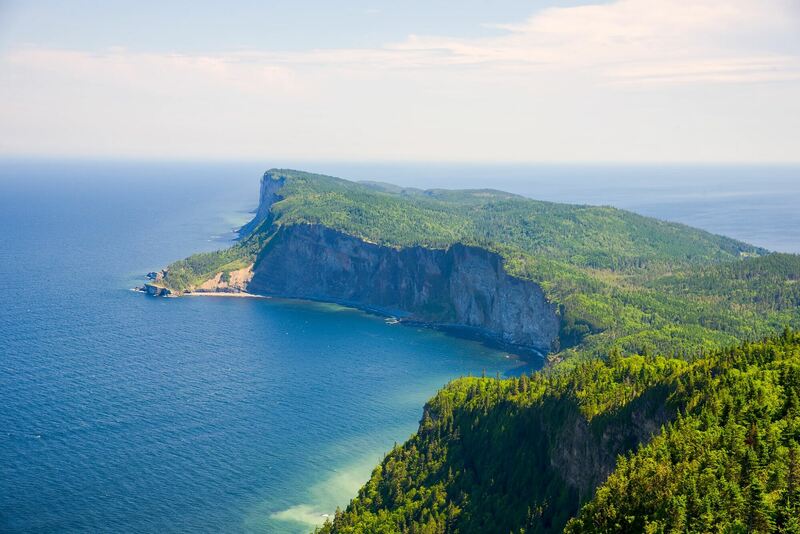 The furthest north and west of the Great Lakes chain, Superior has the highest elevation of all five great lakes and drains into the St. Mary's River. The Ojibwe name for the lake is gichi-gami (pronounced as gitchi-gami and kitchi-gami in other dialects), meaning "great sea." Henry Wadsworth Longfellow wrote the name as "Gitche Gumee" in The Song of Hiawatha, as did Gordon Lightfoot in his song, "The Wreck of the Edmund Fitzgerald". According to other sources, the actual Ojibwe name is Ojibwe Gichigami ("Ojibwe's Great Sea") or Anishinaabe Gichigami ("Anishinaabe's Great Sea"). The 1878 dictionary by Father Frederic Baraga, the first one written for the Ojibway language, gives the Ojibwe name as Otchipwe-kitchi-gami (reflecting Ojibwe Gichigami). The first French explorers approaching the great inland sea by way of the Ottawa River and Lake Huron during the 17th century referred to their discovery as le lac supérieur. Properly translated, the expression means "Upper Lake," that is, the lake above Lake Huron. The lake was also called Lac Tracy (named for Alexandre de Prouville de Tracy) by 17th century Jesuit missionaries. The British, upon taking control of the region from the French in the 1760s following the French and Indian War, anglicized the lake's name to Superior, "on account of its being superior in magnitude to any of the lakes on that vast continent." 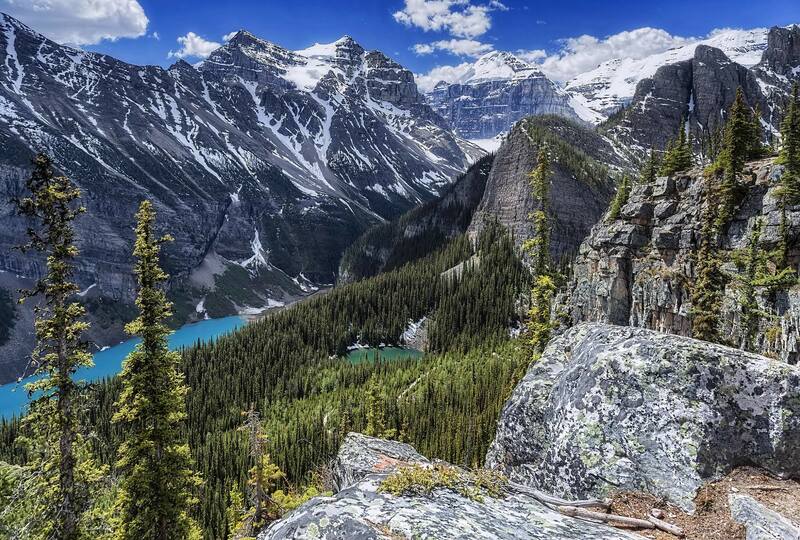 , also known as Assiniboine Mountain, is a mountain located on the Great Divide, on the British Columbia/Alberta border in Canada. At 3,618 m (11,870 ft), it is the highest peak in the Southern Continental Ranges of the Canadian Rockies. Mt. Assiniboine rises nearly 1,525 m (5,003 ft) above Lake Magog. Because of its resemblance to the Matterhorn in the Alps, it is nicknamed the "Matterhorn of the Rockies". Mt. Assiniboine was named by George M. Dawson in 1885. When Dawson saw Mt. Assiniboine from Copper Mountain, he saw a plume of clouds trailing away from the top. This reminded him of the plumes of smoke emanating from the teepees of Assiniboine Indians. Mont-Tremblant National Park (French: Parc national du Mont-Tremblant) is a national park of Canada located north of the town of Mont-Tremblant, and the village of Saint-Donat and Saint-Côme, in the administrative regions of Laurentides and Lanaudière, in Quebec, in Canada. It is the second largest national park in Quebec after Kuururjuaq National Park and it is the oldest national park in Quebec. It takes its name from Mont-Tremblant. 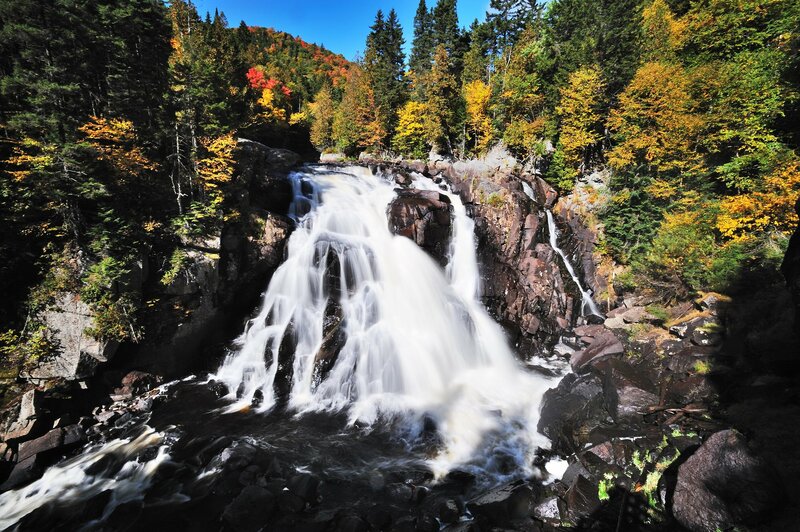 The main objective of the park is to protect an area representing the natural province of Southern Laurentians. 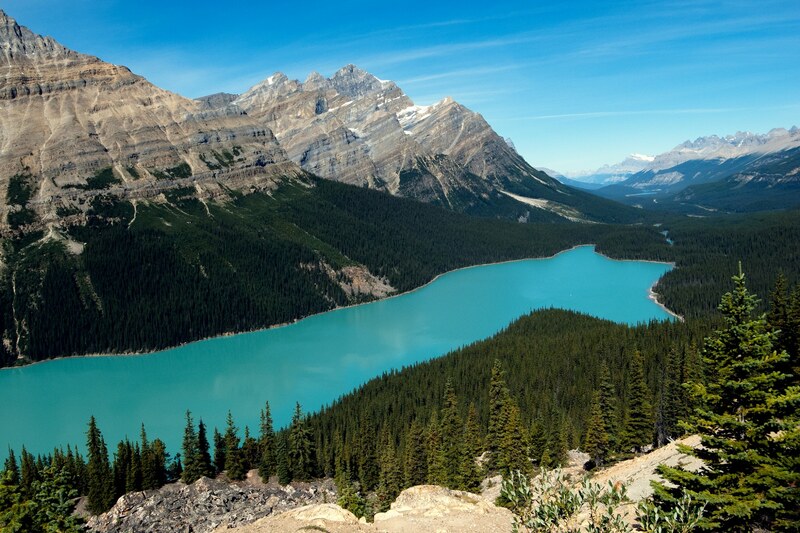 Peyto Lake (pea-toe) is a glacier-fed lake located in Banff National Park in the Canadian Rockies. The lake itself is easily accessed from the Icefields Parkway. It was named for Bill Peyto, an early trail guide and trapper in the Banff area. The lake is formed in a valley of the Waputik Range, between Caldron Peak, Peyto Peak and Mount Jimmy Simpson, at an elevation of 1,860 m (6,100 ft). During the summer, significant amounts of glacial rock flour flow into the lake, and these suspended rock particles give the lake a bright, turquoise colour. Because of its bright colour, photos of the lake often appear in illustrated books, and the area around the lake is a popular sightseeing spot for tourists in the park. The lake is best seen from Bow Summit, the highest point on the Icefields Parkway.